Maybe I’m getting old and mean. I hear that happens to people my age. Or maybe that’s just an excuse, and maybe I’m just not as full of God’s love as I need to be. But for some reason lately I’ve found myself frustrated and yes, sometimes just hateful. I say things that are harsh, and don’t deliver grace when that is what God has extended to me. Today I came across this verse. It stuck out because I just last week corrected someone for not thinking in terms of “edification” (that very word) rather than controlling their actions. 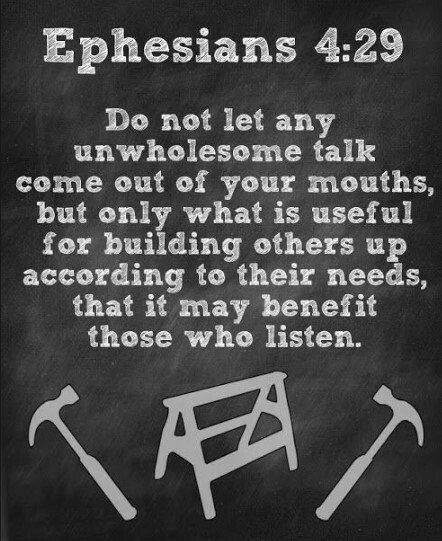 Edification means to build up. I like that Paul attached the adjective “necessary” to it. We all need building up at some point in time, and usually after we’ve failed in some way. Imparting grace means to speak in a forgiving manner, as God would speak to us when we fail. God’s ways are full of grace and gentleness. I’m reminded of the story in Matthew 18:21-35 of the King who decided to collect from all who owed him anything. One of the men owed him a large amount of money, and couldn’t pay. So the King ordered that he, his wife, and his children be sold into slavery to pay the debt. Now, to me that sounds like very harsh punishment, don’t you think? What better way to hurt a man beyond repair than to inflict harm on his wife and children! But when the servant pleaded with the King to be patient, he had mercy on him and forgave the entire debt. All he wanted was patience, but the King gave him grace, undue favor. We’ve all been given that grace by God through Christ that profess to be His children through salvation. We didn’t deserve it, we didn’t earn it, we didn’t even ask for it until He drew us to Him. But He was both patient with us, and gave grace. Far too often, I find myself, and maybe you find yourself too, giving less grace to others than I should. I give less patience, and am more like the King who wanted to just sell them all! The servant who was forgiven did the same thing. He immediately left the king and went to someone who owed him. When that person could not pay, he had him thrown into prison until the debt could be paid in full. Even when the servant begged “Be patient with me, and I will pay it”, he would not relent of his decision, and threw the man into jail. But…the King (think God) heard about it. He called the servant he forgave before him and said “Shouldn’t you have mercy on your fellow servant just as I had mercy on you?” And then, the King threw the servant into prison. Just the servant, and not his whole family. But he had him tortured until he had paid the entire amount. Ah, did you notice what Jesus did there? He added “from your heart” as a clause to the forgiveness. Oh, we can all offer lip service forgiveness. But the problem with lip service forgiveness is that it’s not real, it’s not grace, it’s fake! True forgiveness does not hold a record of the things we forgave. While they might be in our memory, we don’t drag them up. We CHOOSE to go past them, and extend grace. 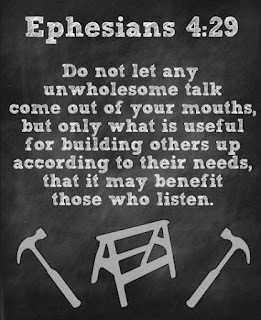 Friends, edification requires grace. To build another up after they have done something wrong to you or someone else, you have to extend grace. Instead of staying mad, you have to build a bridge and get over it! God doesn’t like it when His children grumble against each other. In fact, in verse 35 He expresses His distaste for it by saying that He will not forgive us in return. And that, my friends, is a torture equal to that which the King imposed on the graceless servant. I need God’s grace and forgiveness far too much to rob myself from it. How about you?